The new 10th edition of this well-respected reference includes thoroughly revised and reviewed information with content on new diseases for the most up-to-date information on diseases effecting sheep, pigs, goats, horses, and cattle. Divided into two sections, General Medicine and Special Medicine, the book covers topics ranging from the clinical examination and manifestation of disease in organ systems to specific diseases of the large animal species. Includes important information essential to any large-animal veterinarian, especially those working with horses, cattle, sheep, pigs, or goats. User-friendly format allows the reader to quickly absorb key information. Quick review/synopsis sections for complex diseases make important information easy to find. Features content on major diseases of all countries, including foreign animal and emerging diseases. This time-proven reference covers essentially all infectious and metabolic diseases of livestock. The previous edition was published in 2001. It is intended as a comprehensive resource for the etiology, epidemiology, pathogenesis, treatment, and control of diseases encountered in large animal veterinary medicine. A book like this is critical to the functioning of large animal veterinarians who deal with all aspects of medicine and surgery in a variety of species. This is a "go to" reference for cases that are not routine. It is very thorough and provides adequate detail in each area to allow practitioners to make informed decisions about medical care. It is suitable as a learning or teaching guide for students and a general reference for practicing veterinarians. 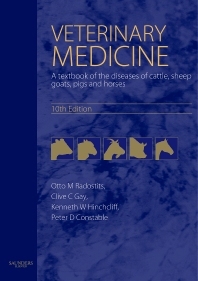 This well balanced book reviews the etiology/pathogenesis, clinical signs, treatment and prevention of infectious and metabolic diseases affecting livestock in appropriate detail for a general reference. The discussions of relevant physiology and pathogenesis are helpful. The summary section that precedes each topic is a good addition to the organization of the material. The list of differential diagnoses in each section is a great help. The only shortcoming of this book is the decision to organize it on an organ system basis and on an etiologic agent basis. The first half of the book, which discusses topics by organ system, is an intuitive structure for a clinician and works well. The second half of the book has worthwhile information but it should be melded into the organ system structure of the first half of the book. For example, the information on Johne's disease should be included under diseases of the intestines, since it is a common cause of diarrhea in cattle. This is a very good book. It is thorough in its scope and strikes a good balance between providing pertinent information in a concise manner and providing sufficient detail on physiology and pathogenesis to provide readers a proper understanding of the subject.